Apple’s revenue and profit for the fiscal second quarter ended March 26 both missed analysts’ expectations. The company also projected that revenue in the current quarter would fall far short of expectations. Worth noting that Apple’s actual results were very nearly in line with the company’s own guidance for the quarter, given three months ago. (Revenue was within guidance, but gross margins were slightly low.) A year-over-year decline is never good news, and is a possible harbinger of a sustained decline, but these numbers, along with Apple’s guidance for the June quarter, should not have been a surprise to anyone paying attention. Certainly not enough to justify today’s 6.25 percent drop in the company’s stock price, which knocked about $40 billion off the company’s market cap. That’s more than the value of Netflix. Welcome to the casino. But for all of the concerns about Apple’s growth, the company still generated profits in the March quarter that are expected to exceed the combined earnings of technology peers Alphabet Inc., Facebook Inc., and Amazon.com Inc. I think an awful lot of investors and members of the news media are like those kids who couldn’t wait: no ability whatsoever to look past the next few months. But look at how things were going before the iPhone 6. 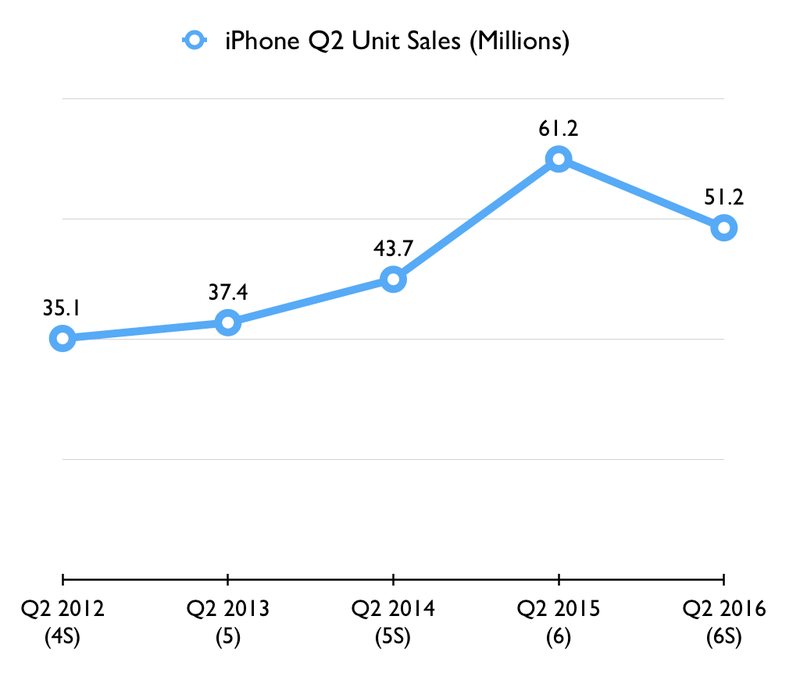 Had the trend of 2012–2014 continued through 2015, iPhone sales last quarter would have been 65–70 million. Instead they were just under 75 million. It’s only in comparison to the huge holiday quarter of 2014 that last quarter looks dull. If sales don’t improve with the iPhone 7, I’ll be willing to believe we’ve reached “peak iPhone.” Until then, the only problem I see is that the iPhone 6 was too successful. His post has a good chart, too. The iPhone has always been a seasonal product, but the seasonality changed with the iPhone 4S, which debuted in October 2011. The first four iPhones debuted in June/July, and the Verizon/CDMA iPhone 4 debuted in January 2011. Let’s call the 4S the beginning of the modern iPhone seasonality era — those released in September or very early October, with support for more carriers. October through December is “Q1” in Apple’s financial calendar, and in this modern era, that’s the biggest selling quarter. First, because it’s the quarter in which the new phone arrives, and tens of millions of people want to buy them immediately. There is no product in the world that generates “opening weekend” sales like the iPhone. I can’t even think of another product where people talk about opening weekend sales, other than other Apple products and major Hollywood feature films. The second factor is that it’s the holiday quarter. In chart form, you can see what an anomaly last year was with the iPhone 6. But given that you can almost draw a straight line connecting the other four points in the chart, I’m not willing to call it a peak yet. But even if we see a return to growth, it might take several years before we see another Q2 with over 60 million units sold.